djkardkreations: CTS #10, DD#35 ~ Spoil Yourself! CTS #10, DD#35 ~ Spoil Yourself! We are having unusually freezing temps here in Northern California and we are losing lots of plants, despite covering them. It's going to be a happy spring for the garden centers and nurseries, but I do feel sorry for all the birds and critters, like Hitler, our resident hummingbird. This morning his sugar water was frozen solid, which we didn't think would happen. Fortunately, my little Playhouse has a little heater so I don't freeze. Today I've brought you a cakey little card made for two favorite challenges. Back out on tour after a Christmas holiday break, doors are open for Show No. 10 at CAS(E) this Sketch! Today's headliner is the fabulous Ms. Lisa Arana!! The colorists brought in for the show today are the outstanding team of So Saffron and Certainly Celery from the Dynamic Duos! I put sparkled frosting on the cake and paws, but even close-up, it's hard to see. Cake and paws. Boy, what shall I do with that, doya spose? There's my friend LuC's grandpa, old Clarence Cakenpaws, yonder in his rocker. He fell off the porch once craning his neck to look at young Jenny and ever since people been sayin he's "off his rocker." Talking about headliners, girls, we have a treat today with the arrival at the Playhouse of Ms. Maureen Merritt! You are going to be very inspired when you visit her website Mama Mo Stamps to welcome her! Thank you so much, Maureen, for joining us! While appropriate, it doesn't mean having one too many adult beverages. It means, "Life is too short!" You might have noticed I'm sort of a nag about that. So while I'm not sure someone hasn't already acronymized it, I've never seen it, so I'm going to claim it until I'm told elsewise. And I'm going to add it from now on to my usual sign off. As always, thank you so much for stopping by to visit the Playhouse. Special thanks to you if you take the time to join as a follower or leave a comment! Darnell perfectly combined challenges! The image of the mouse is so darn cute, love it! So glad you joined us over at CTS!!! I love the card! I'm with you, who would have thought saffron and celery would look soooooo awesome together!! And, your new acronym is great!! I asked my 13 year old, and he hasn't heard of it, so maybe you did make it up!! The 13 year old is all about the text talk. I LOVE it. LITS for sure!! What a fun image and sentiment, but those 2-sided borders look fabulous! A beautiful CAS card for both challenges, and thanks for all you do! I really appreciate your help in putting me in touch with the right people :) LITS - good one!! LOVE your cutie of a card, Darnell. Perfect card Darnell and perfect for both challenges - love it! Such a sweet image and such a clean and crisp card with nice Spring colours - oh roll on Spring! It has turned colder here today too, but at least there was sunshine instead of rain today. We were able to get out for a nice walk with the dog today - as you say LITS so we needed to make the most of the dry weather. I love the way you've mounted this on the fresh green and yellow, Darnell! And you're right - LITS, so enjoy! Oops - and thanks for playing along with us this week at CAS(E) This Sketch! Ooh, adorable image and fabulous sentiment. I love it in these colors. Wonderful card, Darnell. I love your card! Yes it is freezing here - we've been walking at Lake Chabot in 39 - 45 degree weather these past few days! Glad you have a heater in the playhouse! I'm snuggling up with the cats! Stunning! Love the layout - might nab this idea! Darnell love the card you shared today perfect for both challenges! A sweet little critter. I had to re-read your post a couple times thinking Maureen actually came to visit--ha ha, but wouldn't that be fun? So if we decide to jump ship in March and head to Myrtle Beach or Florida you want get a visitor at the Playhouse. Our temps are just the opposite! It's been 70-73° here in Florida...we've flipped back and forth from the heat to the air conditioning for the past month. The low that we've had has been in the 30's! No wonder everyone is sick! LOVE your card. That color combination is fabulous and the image is just adorable! I couldn't have said it better myself...LITS!! So totally sweet Darnell! makes me want to eat some cake... and I happen to know where the Christmas cake is hiding lol! What a sweet image, Darnell. That looks like me left alone in a room with chocolate! So it's been crazy cold by you? It's crazy warm in NY and we have been enveloped in thick fog for days. Okay, Darnell, that's about cutest thing I've seen all day :-) great job with the colors and sketch. That Mousie is just adorable! Love the border you added to your stamped image. Take good care of Hitler. That's one thing I miss about being away from home for 2 months - no bird feeding and watching. Unless you call seagulls birds. I call them noisy. Just so adorable...love that little guy making a pig out of himself with all that cake! 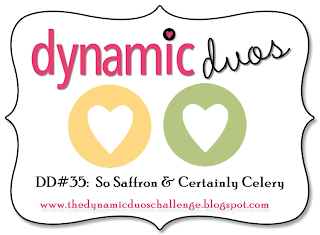 I love this weeks colors for Dynamic Duos too, so pretty and it reminds me of spring. I pray that this cold weather ends sooner than later, I just hate leaving home where it is nice and warm with a roaring fire. Oh, this is so cute. And, what a great sentiment--so true. And, what does 'thud' mean? How pretty, love how you combined the challenges! I really like that sketch, too! It's unseasonable here in PA....weird weather we're having anymore. oops....I meant to say that it's unseasonable WARM here in PA. It was 60 degrees here this weekend and all our snow has melted. Cold and a titchy bit snowy here today too. That looks like me when I get my hands on a cake! LOL! Hope your plants hang in there and that Hitler doesn't abandon you for warmer climates! It's chilly here too - in the mid 60s! Brrr! Thanks for playing along with CAS(E) This Sketch this week! Oh so sweet! That spoiled little guy is absolutely charming. Perfect colors and such a fantastic use of the sketch. So glad to see you at CAS(E) this Sketch! So I guess the theme of your post is, "LITS, so spoil yourself silly!" OK, I can do that : ) Fun card, Darnell, love how you have matted it flush with the corner. Just a little different! Such a cute image! I am sure my temps here will warm you up......31 below zero this morning! Now, you probably think you are having a heat wave! That little critter looks like he/she is really enjoying that cake! I love the way you did the edges! And yes, LITS! Love this card. So very, very cute an the coloring is fantastic! Love your new acronym--the perfect reason to 'spoil yourself silly'! Your mousie friend is just TOO CUTE! Can't help but love those little Penny Black critters. And what could be better than cake--chocolate at that--YUM!! Do you know how far down I had to go just to make a comment ....far! :) love your take on the photo and the adorable little mouse stamp you used. Your card is cute and elegant at the same time. Our water fountain froze a bit on the top, never thought to check the hummingbird feeder.duh! Now I will. Thanks ! super sweet image, love this!! 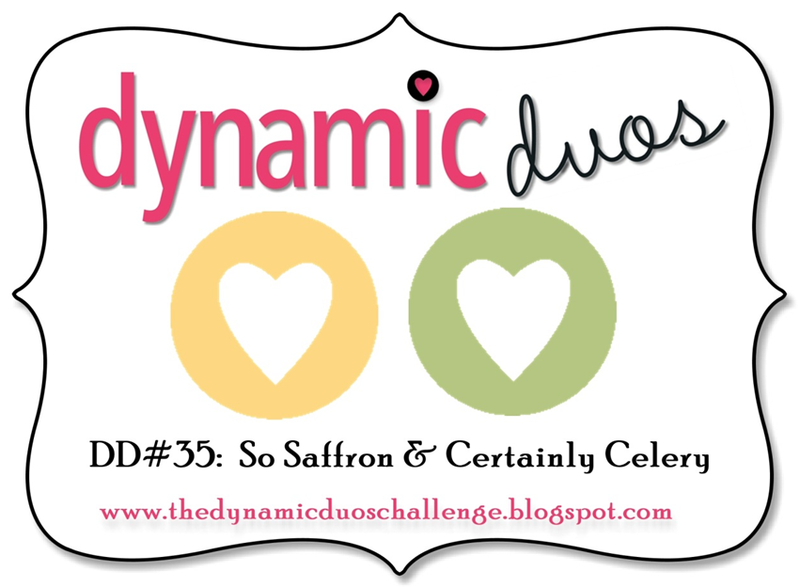 Thanks for joining us this week at Dynamic Duos!! Great job combining the challenges! I love that cute little mouse. Thanks so much for joining us at CAS(E) this Sketch! super sweet card, darnell... a wonderful take on the sketch! Love your added twist on the sketch ~ looks fantastic with the layered scallped border and the mouse image is super sweet! Love your new LITS acronym ~ I'll definitely be borrowing it!